After a short hiatus, Wednesday, April 11 marks the latest new episode of Chicago PD, and over the course of the final few episodes there are a ton of meaty stories that are still hanging in the balance. Not only are we going to see the investigation into Hank Voight escalate, but to go along with that Hailey Upton will do her best to move forward from the harrowing case she went through stemming from her past. She seemed to be on the road to recovery at the end of the episode entitled “Ghosts,” and with that the bond she has with Halstead certainly seems to be growing stronger as well. 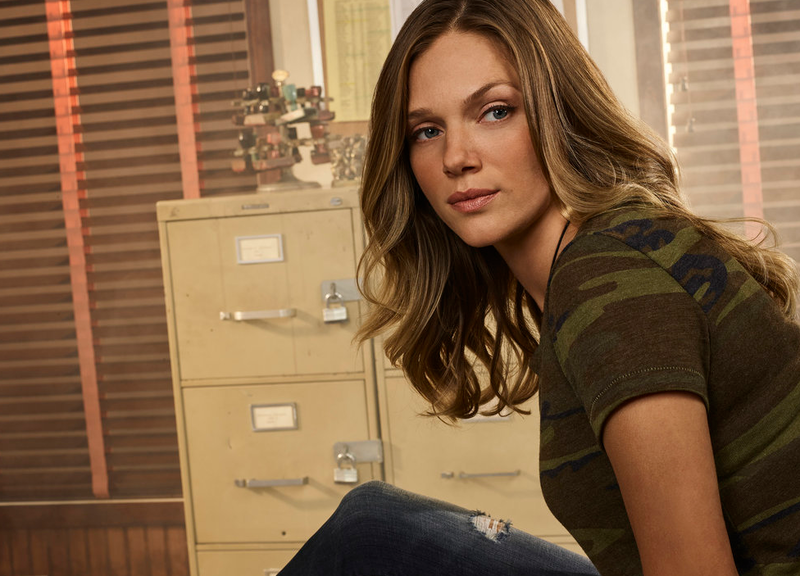 In our interview below, Tracy Spiridakos reflects on Upton’s story this season, including her excellent performance in “Ghosts,” her character’s relationship with Jay Halstead, and a few other things she would like to see in the future. CarterMatt – Are you starting to get a sense as to how Hailey’s story is going to end this season? Tracy Spiridakos – We got to explore her in “Ghosts,” and then there’s a lot of other stuff that’s going to come up for the team. We’ll [hopefully] see what next year brings. How excited were you to embrace this undercover job on this past episode? It was really fun! I was also excited to get to know this part of Hailey’s history. I knew that I had gone undercover and things happened, but I didn’t know what until this episode. I was thrilled to be able to get to know her a little bit better for me and for the audience. As an actor, it’s such an exciting thing to be a character playing another character. It’s really interesting. Did you craft this character as playing someone completely independent, or someone as played through Upton’s own lens? For me I approached with Upton playing a character rather than it being a separate entity, especially with knowing so much about what happened between her and Booth … I wanted to keep it alive in moments where he would turn away and you got to see a flash of [Upton’s] anger towards him and her hatred, but also still a fear that he brings out. I wanted to make sure that all of those emotions came through. For me, it was what Upton would do in playing a character. Do those experiences stick with her when the show comes back? The stuff that happened to her [in the past] happened three years ago, so that lives inside of her and she’s been pretty good at being able to control that. But, at the end of the episode it’s all on the surface and she’s exhausted and sad bringing back all the memories. That’s kind of where we leave her — going forward, she has to figure out a way to process all of the things that happened, but the one good thing is that she caught him — he’s gone away and he’s going to be in jail for a really long time. That’s all she wanted. One of the things that I think this season has done a really good job at is building the relationship between Upton and Jay — your character was really there for him earlier this season and now, he has been there for [her]. Are things going to continue to grow between the two? As we do approach the end of the season there are some other things that are the focal point but that friendship between them only gets stronger and I think it’s kind of cool that both Jay and Hailey have been through such dark stuff. They can be there and be strong for each other. They know first-hand some of the pain and loss that they’ve experienced. It’s been almost a year now since you first appeared as they character, and I know they don’t tell you all that much about who you are going to play. Has there been anything that surprised you about Hailey this past year? I don’t know about ‘surprised,’ but there were things that I was excited to showcase. One of the things I really loved was in episode 4 when she and Ruzek kind of butted heads — I loved just exploring this character who was unapologetic about who she is and what she stood for. [This past episode] was really big for me. I was looking forward to seeing what the backstory was and getting to explore all of that was one of the ones I was the most excited about. Do you think that Upton has a take on what’s happening with Voight and Woods? Both she and Voight each have a very specific point of view on what it means to be a cop. We don’t explore too much on that just because Hailey wasn’t there when [the death of Voight’s son happened], though there was all sorts of rumors and speculation when she came on board. But, she doesn’t really know so we don’t really see Hailey’s perspective on it. We’ve gotten a chance to see some friendships form between Hailey and some characters. I’m a big Hailey and Atwater fan — I even mentioned to you that at One Chicago Day — but are there any relationships and friendships that you want to see more? I know for me I’d love to see more with you and Trudy. I love the Trudy relationship for sure and I love all of these actors and characters so much. But Upwater! That’s a great one too (laughs). I really do love some of the stuff that I’ve gotten to do with Marina [Squerciati]. I think our characters are different but we support each other in our way. I love seeing two strong women working together. Ever since Rick Eid has come on board it feels like Chicago PD is doing more and more stories that are super-relevant to what’s going on — there was the crossover about fake news and there’s been many episodes about the relationship between the police and the public. Does that add an extra weight to what you’re doing, knowing that you’re talking about stories that people are actively discussing? I’m proud to be a part of a show that wants to talk about relevant issues that are happening right now, rather than pretending that things aren’t going on around you. I think Rick has done a really good job with that and it’s a great thing. How are you feeling right now about a season 6? Is the cast optimistic? Yeah! I think so. We would love to come back. Is there other element of Upton’s backstory that you’d want to explore a little bit more, and is that something you think about? What’s the ideal Hailey Upton episode? This past episode was a big one, but going forward I would love to see Hailey’s brothers. I know she has an edginess that I’d love to dip into and explore a little bit. I see her as someone who rides dirt bikes in her spare time (laughs). I see her doing something different that would be fun. Want some more Chicago PD news right now?